There are so many people who have helped us over the years. We thank our parents, Wade Hudson, Sr. and Lurline Hudson, and Hayes and Lillian Willis for providing a firm foundation that made it easier for us to embark on this journey. It is a foundation built on faith, love, service, responsibility, commitment, and a firm belief in hard work. We thank the many people who have served on our staff over the years, especially Willie Hudson, director of sales, and Major Hudson, shipping manager, for their support, hard work and dedication. Both Willie and Major have been with Just Us Books almost from the beginning. We thank owners and operators of Black book stores and individual vendors who carried our booksand sold them in stores, at street fairs and conferences and other events. We thank our family and friends and Imani church family for their loveand support. We thank parents, teachers, librarians, and children for buying our books and encouraging us with warm wishes. We thank our talented authors and illustrators who have worked with us tirelessly to create authentic stories and images that resonate with our community and reflect our heritage and our history. We thank all of our volunteers and interns who are always willing to help in any waythey can. Last but not least, we thank our children Katura and Stephan. They have been on this journey with us since they were little. Both hold important positions at Just Us Books and in other projects we have undertaken. They were and will continue to be our inspiration. They are also integral parts of the legacy we will leave. This legacy links us to the past, the present and thefuture. From 1988-2008 has been twenty years! That's a long time and the road hasn't always been a smooth one. But we love what we do and we thank God for the gift of this ministry of encouraging, enlightening, informing and empowering young people through books. 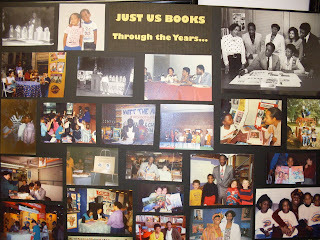 On Saturday, Oct. 25, Just Us Books will celebrate its milestone 20th anniversary with a children’s book fair celebration. The event will be held from 11 am to 3 pm at the Whitlock/Lane Cultural Center of Imani Baptist Church, located at 117 Elmwood Ave. in East Orange, NJ. 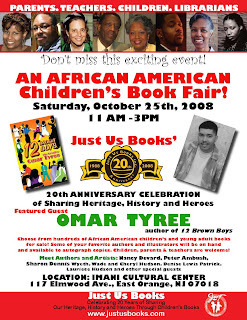 New York Times best-selling author, Omar Tyree, author of Just Us Books' newest release 12 Brown Boys, a collection of short stories that focus on the lives of pre-teen boys, will be the featured author. The book fair will also feature other celebrated children’s book authors and illustrators who will be available to autograph copies of their books purchased at the event. 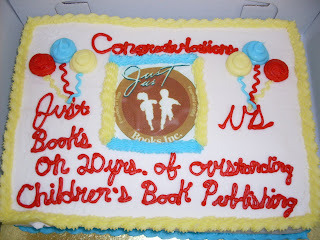 Just Us Books’ 20th anniversary is not just a celebration of our success as a company. It’s a proud recognition of 20 years of children reading, learning, growing, and affirming Black heritage, heroes and culture. We’re proud to celebrate this important milestone in our history with our community and our many supporters and hope to see you there. 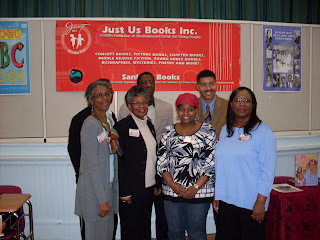 The concept of "multicultural literature" can present challenges to mothers and fathers who want to raise well-rounded children prepared to function in the 2008 global village. How does a well-intentioned parent find and select good books for his/her children? What kinds of stories affirm that child's place on the planet? Folk tales? Fairy Tales? Nonfiction? Biography? What kinds of picture books prepare children for the complex world in which they live? What kinds of stories open a window of possibilities for that child's future? What kinds of books help children to dream of a better world for all peoples? Can books help us to make new friends and know our current neighbors? Must other races and creeds be represented for a book to be truly multicultural? What specific titles should form the core of a child's personal library? Publishers, librarians, booksellers, educators, and parents (in particular) of all philosophies, budgets and ethnicities play important roles in this conversation. Since books provide a conduit of exposure to people, places and worlds both similar and different from our own, it makes sense to expose our children to books that embrace a diversity of cultures, interests, values, nationalities, and hues, right? When I was a child growing up in segregated schools in Virginia, none of my school books contained "colored children" who looked or acted like me. 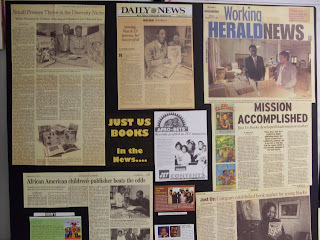 The main public library in our town was not open to "Negroes" as we referred to ourselves at that time, and all of the "good" books--meaning new ones--were there. The "colored" library was a tiny cramped space that contained mostly used and discarded books. Why then would any child want to read them? When I became a parent I was determined that my children have a collection of wonderful books. And yes, like many parents I believe that seeing and experiencing diversity in children's literature is a good thing. But how can a parent know what is good? What is fair? What is authentic? What is stereotypical? What is to be avoided? This space is dedicated to exploring how children's literature can inform our world--how effective presentation of the written word and visual images can help us as parents to guide our children toward empowerment and discovery of their inner selves and their ultimate possibilities. This space is dedicated to exploring diversity in children's literature and to finding ways to get good books in the hands of children for their information and their joy. 1. Multicultural literature confirms that we live in a global village and that the world is pluralistic and made up of many different kinds of people. 2. It helps to develop self esteem in all children through inclusion rather than exclusion. 3. It provides knowledge and information about people from all parts of the world. 4. It can change the way students look at their own particular society and the world by offering varying perspectives or different ways of viewing the same situations. 5. It can promote/develop an appreciation for diversity. 6. It can help children think critically and to ask questions. 7. Like all literature, it can provide enjoyment and appreciation for unity and variety in the human experience. 9. It can provide positive role models. 10. It can create a bridge between student's real-life experiences and intellectual learning. Why is multicultural literature important to you and the children in your life? We welcome your thoughts. And be sure to check future posts for book recommendations, tips on how to encourage the children in your life to read, and suggestions on what to look for when selecting multicultural literature.